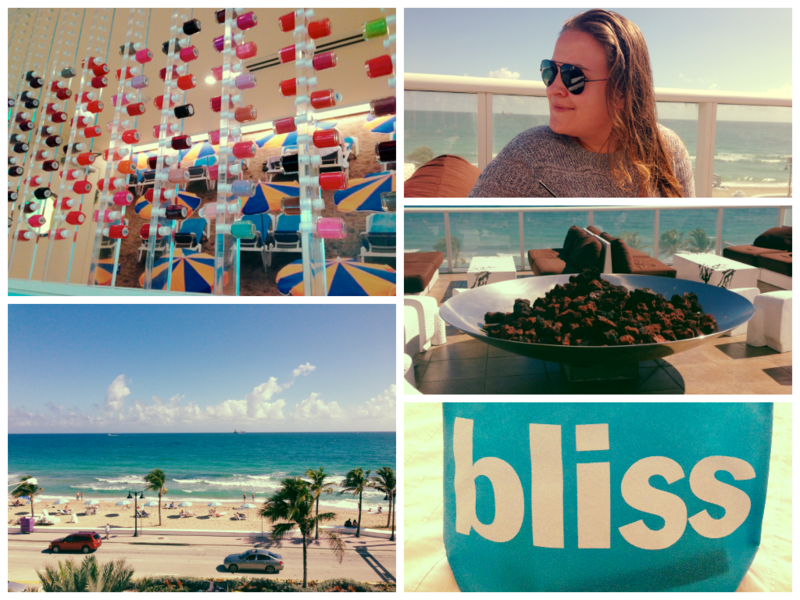 If you follow my Instagram then some of you will have seen that a week ago I spent the afternoon at the Bliss Spa in Ft.Lauderdale. This was my very first time to this Spa and to let you all in on a little secret I haven’t ever been to a spa before! So as a newbie I was on cloud nine the entire time to say the least. The Spa itself is inside of the W Hotel and right when you get out of the elevator the aroma of fresh and tranquil oils instantly relax you. After checking in and changing into the softest robe you could ever imagine I relaxed and waited for my massage therapist. 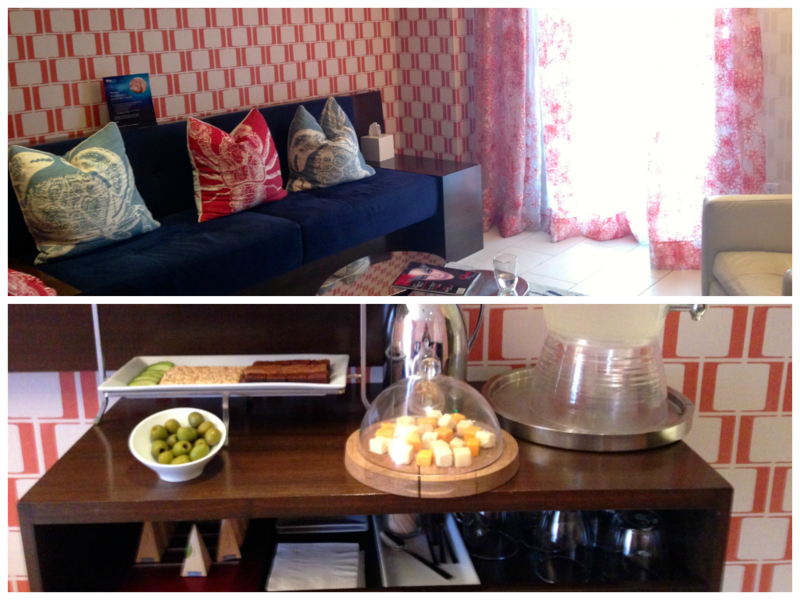 I wish that I could have taken the room home with me, I loved all of the colorful decor from the red and blue nautical pillows to the coral inspired printed curtains. It really compliments the location of the spa which is right on the beach! They had an area with bite sized brownies, blondes, veggies, crackers and a platter of cheeses. To accompany the snacks they had lemon infused water and an assortments of my favorite teas; it was truly magical and I hadn’t even had my treatment yet! At Bliss I chose the Fully Loaded and it really is the works! It includes the most amazing facial with a fruit acid wash, oxygen wrap, a collagen boosting serum, a skin specific mask and their signature O2 blast! While the massage therapist is working her magic on your skin your hair is getting some love too. The Hair Dew treatment exclusive to the Bliss Spa’s that pumps your hair with essential oils and moisture that your hair craves. And to top it all off as your skin specific mask is soaking in your massage therapist is giving your neck, shoulders and feet a wonderful rub down. I told you all it was the works!! It was hard not to be relaxed after all of that love and was so sad when it was all over. I truly can not wait to go back and get pampered some more and I don’t think I could have picked a better place to get my first facial. If any of you are in the area or looking for a pick me up give Bliss Spa a try and I promise you will not be disappointed! And I loved the products so much I went home with some of my favorite treats from the day! Thanks to the holidays I have gotten an abundance of goodies to try. 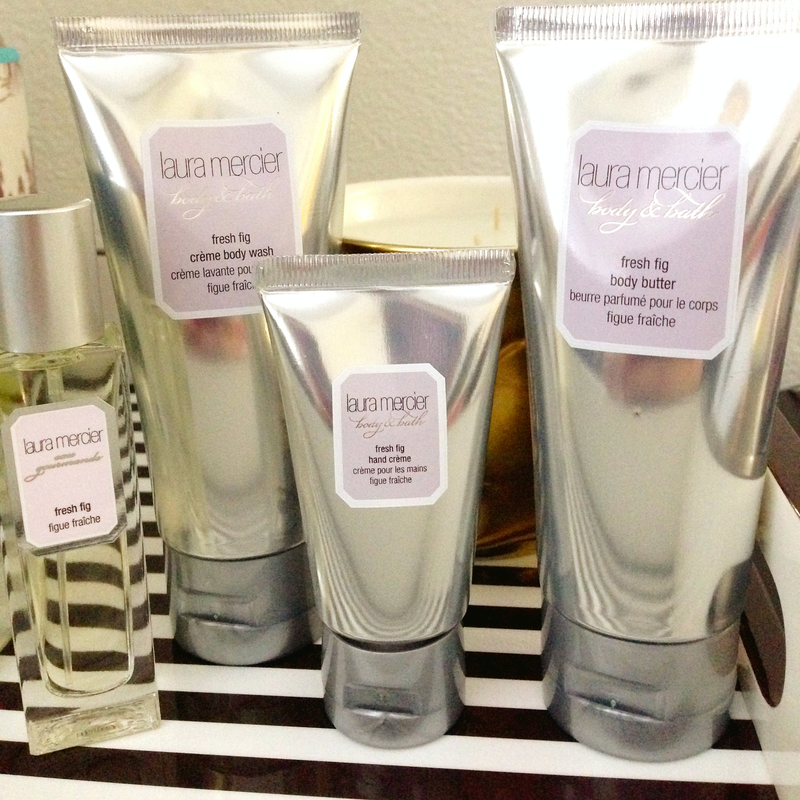 Lately I have not been able to get enough of this Laura Mercier Fresh Fig Set that I got from my wonderful boy friend. This set includes all of the essentials one may need either for everyday or perfect for traveling. This particular set came with a travel fragrance, Body wash, Body Butter and a hand cream and they are all AMAZING! This fragrance isn’t too over powering and sweet, it gives you just a subtle fresh smell that perks you up. I also really enjoy how simple and elegant looking the packaging is with the crisp silver bottles and the pop of fresh lavender color of the label. 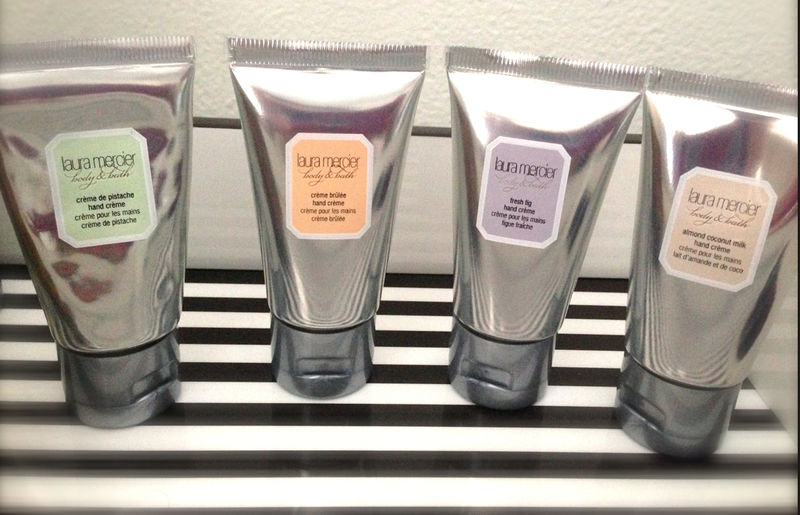 Another goodie from Laura Mercier that I got was the sample of hand creams in all of her signature scents! (yes the fig comes in this one too). I am addicted to hand creams, probably because I never like when my hands feel dry after using so much anti-bacterial or from constantly washing your hands. I love how cute all of these are and obviously they all smell amazing so it was hard to figure out which I wanted to use first! I love love love Valentines Day not just because its a wonderful day to celebrate love but I personally enjoy all of the pink items and all the heart decor. I understand you don’t need just one day to tell all the people in your life that you love them but it is a fun time to just take a second to tell someone that I LOVE YOU! But like most people you don’t want to spend a fortune on your valentines day goodies but still want to find something nice and something you know they will love. Now I will say I tend to give little things like these to my best girlfriends or my mom because everyone deserves something cute! P.S!!! Stay connected with me through Bloglovin for all up to date posts that are simply amazing! Like many of you I live for a good deal and an awesome sale but I can’t fib and say that whenever I go into saks that I don’t drool all over the beautiful items that I covet. Since valentines is always a fun day filled with love both giving and receiving I decided to make a fun little shopping guide for all of my fashion obsessed readers (myself included). I hope you all enjoy these picks and feel free to leave a couple of your favorite splurge worthy V-Day gifts.